Ok, this beef sausage rice bowl might not a serious recipe but found this is something that can inspire you to cook quickly during the weekdays or east and fast brunch idea! 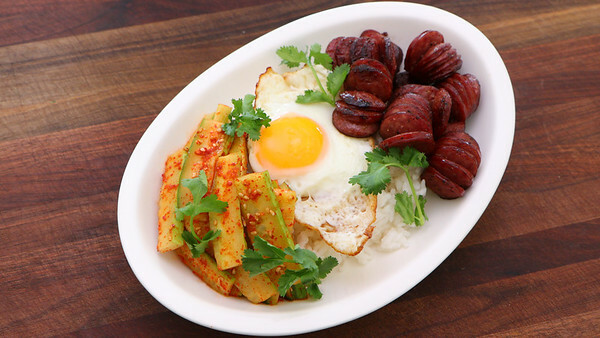 I made this beef sausage rice bowl as breakfast on the weekdays and also brunch for me and my hubby! 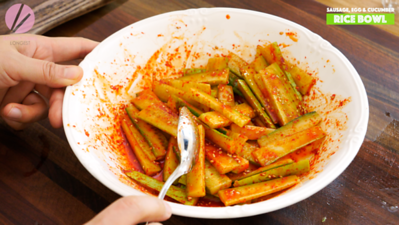 Cut cumber into 2-inch long slices. Combine gochugaru, vinegar, fish sauce, plum extract and sugar and mix well. I used Korean apple vinegar but you can use any vinegar you want! In Korea, we use this plum extract we call Maesilaeg. It’s simply preserved green plum with sugar. 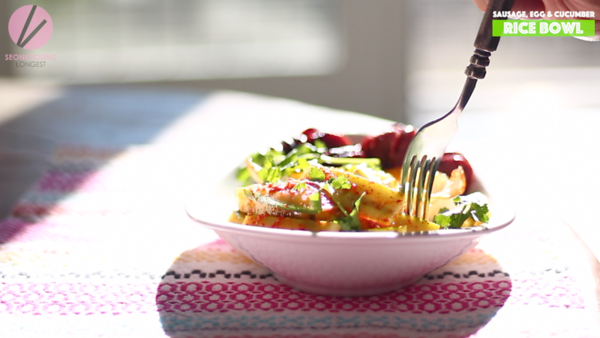 It’s sour, sweet and add deep fruity flavor into the dish. If you love Korean food, definitely worth the investment. The one I recommend, it can a bit pricy but it is the real deal one- because lots of the cheap versions are nothing different than using just sugar. 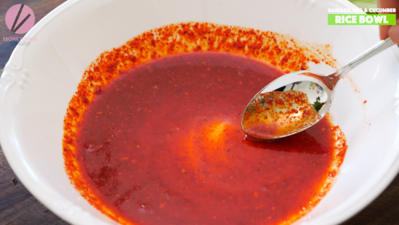 Also you will need a tablespoon or two per recipe and it lasts a few months in the refrigerator! Add cucumber and sesame seeds and toss all together. Set aside. 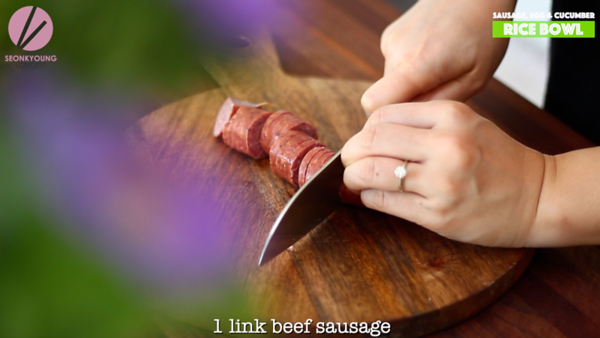 Slice beef into 1-inch long pieces with 4 scores. 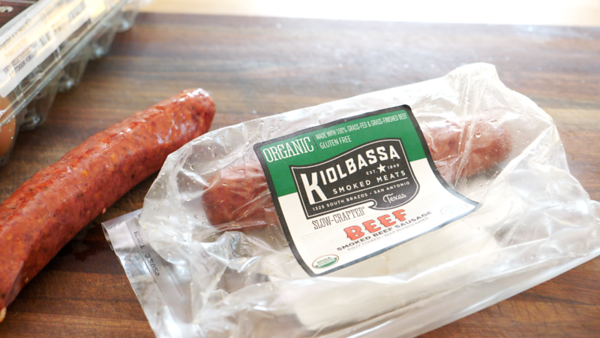 This is my recent favorite beef sausage from Costco. The flavor is simple yet delicious and the texture is fantastic! Ready for 2nd package!! 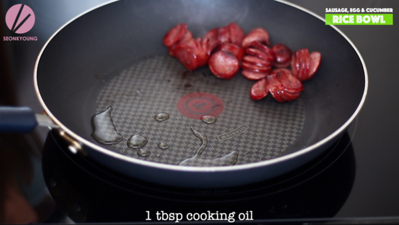 Cook over medium high heat for 5 to 6 minutes with or without oil. It’s up to you, I used nonstick skillet and didn’t need extra oil to cook the sausage since the sausage release lots of fat to the pan while cooking. 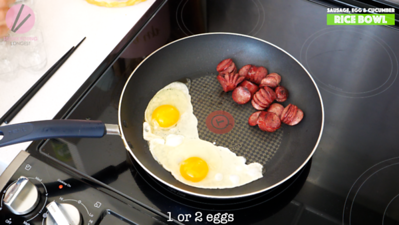 Set the sausages to a side and add cooking oil to fry egg. 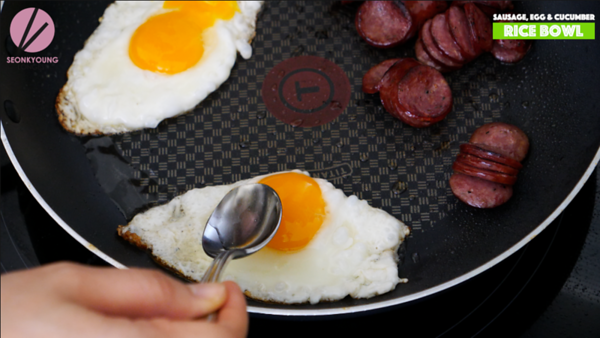 Cook the egg to your desire doneness. If you like sunny side up, this is a tip for you! 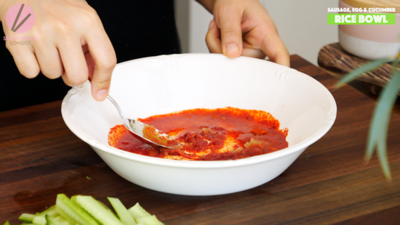 Using a spoon, pour the hot oil over the thick egg white and a couple times over the egg yolk. This way I can cook the egg white all the way through without flipping over and egg yolk is nice and warm! Place warm cooked rice on a serving bowl, arrange sausages on one side and egg in the middle. Place cucumber salad on the other side and top with some cilantro leaves. 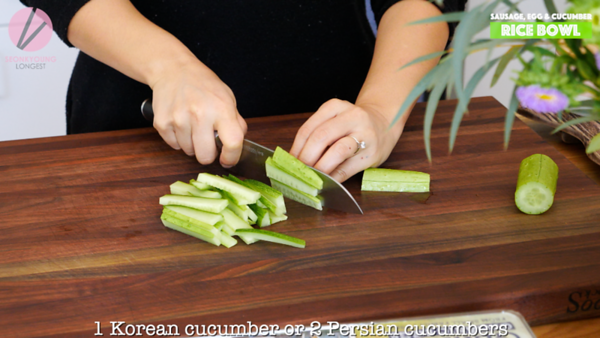 Cut cumber into 2-inch long slices. Combine gochugaru, vinegar, fish sauce, plum extract and sugar and mix well. 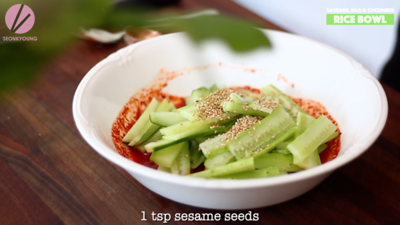 Add cucumber and sesame seeds and toss all together. Set aside. 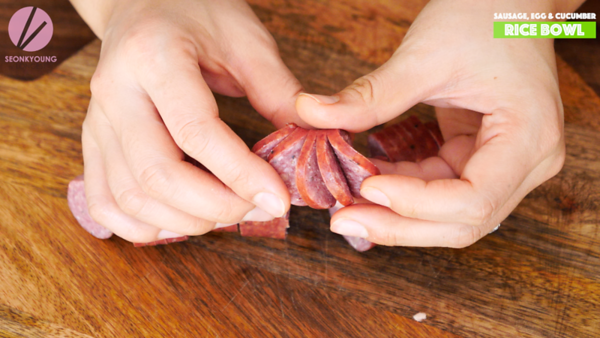 Slice beef into 1-inch long pieces with 4 scores. Cook over medium high heat for 5 to 6 minutes with or without oil. 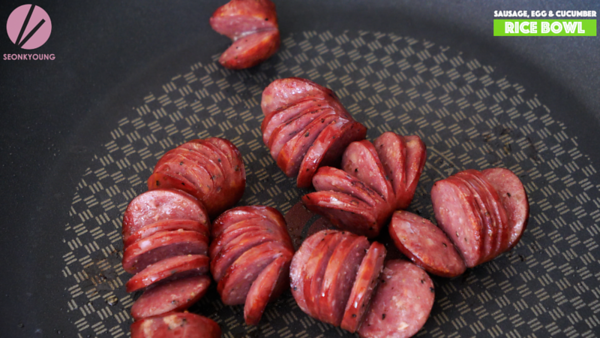 It’s up to you, I used nonstick skillet and didn’t need extra oil to cook the sausage since the sausage release lots of fat to the pan while cooking. Place warm cooked rice on a serving bowl, arrange sausages on one side and egg in the middle. Place cucumber salad on the other side and top with some cilantro leaves. Enjoy! If no plum extract is used, would subbing with apricot jam suffice?